The original version of this post is in my personal blog. 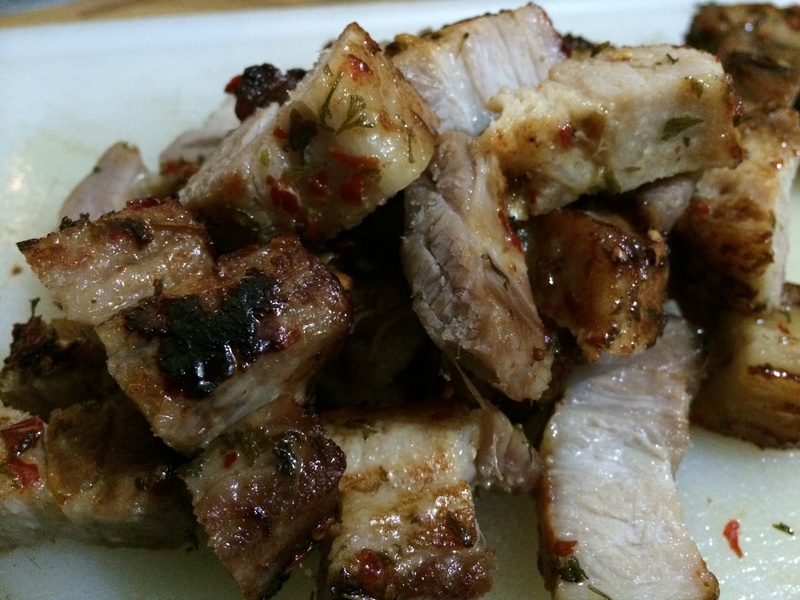 I used to buy salt and chilli belly pork from Asda prepacked, premade and frozen. The pork was lovely, and the flavours were simple, uncomplicated and delicious. There is nothing more enjoyable than straightforward goodness. But then Asda chose to discontinue the frozen version of the salt and chilli belly pork that I liked (I’d tried the “fresh” refrigerated version and it didn’t taste as nice for some reason). I’d lost my go-to freezer staple and I didn’t like the sinking feeling in the pit of my stomach. It felt like I was losing a good friend for reasons unknown! Luckily, I still had the packaging sleeve in my recycling bag so I looked at the ingredients list one evening and thought I could actually make the ingredient list a bit simpler. 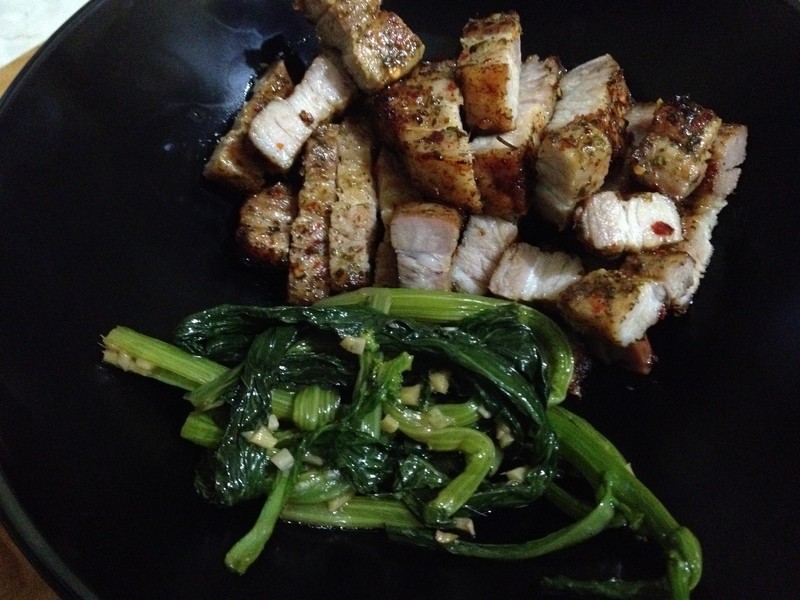 The taste reminded me of rotisserie pork that was readily available in the Philippines, so I started from there. Salt and pepper were the mainstays of this lovely Filipino “fast food” option. There are only 5 ingredients to this lovely no-fail recipe. Of course you can change the herb of choice added (I’ve tried dill and it works! ), remove the chilli and replace it with just pepper, add soy sauce instead of salt…the permutations can go on forever! Feel free to customise this recipe according to your tastes! The beauty of this is that you can make it ahead of time and just store it in the fridge and take it out when you’re ready to cook it. Oh, and like the supermarket version that inspired me to create this recipe, this freezes well too! I usually have a pack in the freezer ready for when I can’t think of what to cook for supper. It’s a reliable old stand-by dish! Oh and I’d love to hear how you got on with the recipe, if you try it! Mix salt, spices and oil together in ziplock lock bag (other brands of resealable bags are acceptable!). Add the belly pork slices and marinade for at least 2 hours, even better if marinated overnight. Line a baking tin with parchment paper and lay the belly pork slices. Place in the middle of the oven. Bake the belly pork slices for 30 minutes, turning the belly pork slices halfway (you can also choose to cook this on the barbecue!). The belly pork slices will come out lovely and brown. Cut into bite-sized chunks and serve. This is great with rice and greens — or if you’re watching carbs like me, just greens (like wilted kale or cabbage, or steamed pak choi or choi sum).